I am currently a Presidential Professor at The University of Nebraska, teaching the writing of poetry. My poetry has been collected in a number of full-length volumes and special editions and has appeared in many literary periodicals. A number of my poems appear in textbooks and anthologies currently in use in secondary school and college classrooms. I am the editor of a weekly newspaper column, “American Life in Poetry,” which is carried in over 150 newspapers and is available online at www.americanlifeinpoetry.org. It is jointly sponsored by the University of Nebraska-Lincoln English Department, The Library of Congress and the Poetry Foundation. Distribution of the column has continued to grow despite the problems in the newspaper industry and many readers now receive it via email. It, too, is being used in classrooms. The column has an estimated circulation of three and a half million readers around the world. In the past few years I have enjoyed writing for children, and those books are listed below. Born April 25, 1939, in Ames, Iowa. Attended Ames Public Schools, Iowa State University (B.S. 1962), and the University of Nebraska (M.A. 1968). Worked for many years as a life insurance executive; now retired and teaching half time at The University of Nebraska. Married to Kathleen Rutledge, retired editor of The Lincoln Journal Star. One son, Jeff, and two granddaughters, Margaret and Penelope. Literary Biography: The Poetry and Life of Ted Kooser, by Mary K. Stillwell; University of Nebraska Press, 2013. 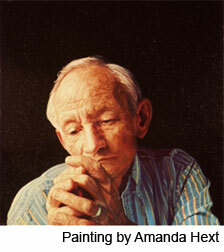 © 2013 Ted Kooser | For further information, contact Alison Granucci at alison@blueflowerarts.com.